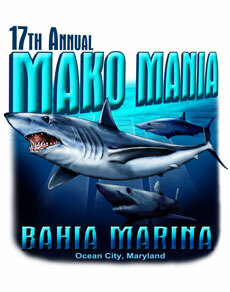 The 17th Annual Mako Mania shark tournament gets underway next weekend with dozens of boats and teams of anglers expected to compete in the first significant offshore tournament of the summer-long series of events in Ocean City. With warm water starting to show up in the canyons off the coast of the resort, the early offshore fishing season is starting to heat up just in time for the annual Mako Mania tournament hosted by Bahia Marina. Sharks of all sizes and species are typically the first game fish to arrive off the coast of the resort and this year should be no different. Over the week or so, a significant number of makos and other shark species have been caught in the waters off the coast of the resort, signaling the fish are arriving just in time for the annual Mako Mania tournament. For example, the “Hellbent” last Monday caught a 281-pound thresher at the Twin Wrecks, while the “Rare Breed” caught a 265-pound thresher at the Fingers. While the event is all about fishing, and particularly sharks, as its name implies, the activity on land is no less exciting. Curiosity seekers will cram into Bahia Marina each afternoon during the tournament for a chance to see a potential winning shark raised at the scale in what has become a festival of sorts celebrating the arrival of another summer offshore fishing season. The event gets underway next Thursday with a captains’ meeting with the first of three official fishing days starting early next Friday. Other fishing days include Saturday and Sunday, and the boats and their captains must choose to fish two of the three fishing days. Mako sharks are the featured species in the tournament although there are also divisions for threshers and bluefish, for example. Like most tournaments in the area, the conservation of the various species is paramount to success, and to that end, an award and a check for $1,000 is given out for the most shark releases called the W.W. Harman Award.